Available for summer charters in the East Mediterranean, PARIS A is a lavish Maiora 115’ launched in 2009. A comfortable cruising speed of 22 knots and a maximum speed of 26 knots allow guests to reach their next destination swiftly, yet in total security and comfort. An expert crew of 6 aboard luxury charter power yacht PARIS A will attend to your every need during the cruise. 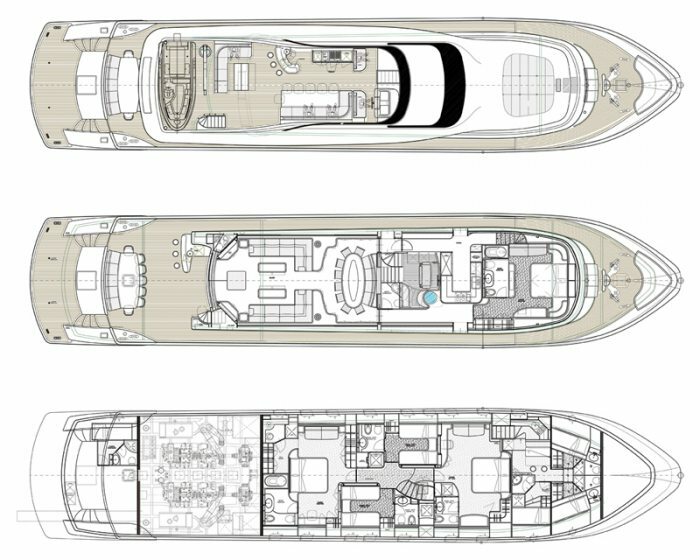 This streamlined beauty blends harmoniously the elegance and spacious layout of classic mega yachts with the performance and latest technology expected aboard luxury power yachts without compromising comfort and stability. The interior boasts custom-made furnishings, elegant lighting, dark floor paneling and a soothing color palette of rich brown, cream and caramel creating a tranquilizing ambiance throughout. The modern main salon beckons for lounging on one of the oversized sofas with extra cushions while the dining area is fitting for formal as well as more casual occasions. It is also fully equipped for onboard entertainment with a 46’ LCD TV and a Bose home cinema system. Luxury charter power boat PARIS A provides accommodation for up to 12 guests in 5 beautifully appointed ensuite cabins including one master, two VIP and two twin cabins, each with an additional Pullman. All of the cabins feature elegant bedding, plenty of built-in storage and cozy off-white carpeting while the master and the VIP cabins boast private lounging areas for the utmost on onboard intimacy. The outside spaces aboard luxury charter power yacht PARIS A are a must for all passengers wishing to bask in the sun or shade on the fore, aft and sundeck. The former is irreproachable for soaking up the warm rays on oversize sun pads while the aft deck invites guests to enjoy alfresco meals at the large and comfortable table. The sundeck is also a magnificent living space with a table with chairs and a settee as well a fully-equipped bar and barbecue calling for cocktail parties or afternoon family gatherings. With a vast selection of water toys available onboard, luxury power yacht PARIS A promises unforgettable moments on the sea with three tenders (one with glass bottom), a waverunner, water skis, kneeboard, a banana, tubes, a canoe as well as fishing and snorkeling equipment. The swimming platform is also a fantastic way of accessing the sparkling water directly from the yacht. Whether you wish to island-hop in Greece, explore enticing ancient destinations of the Turkish Riviera or visit the awe-inspiring Croatia, luxury charter power yacht PARIS A guarantees a blissful charter vacation! One Master cabin. Two VIP cabins. Two cabins with twin beds plus a Pullman berth each. All cabins have en suite facilities, TV, DVD, Radio, CD player. Данный веб-сайт использует файлы cookies с целью предоставления услуг в соответсвии с условиями Политики файлов cookies. Пользователь может определить условия хранения и доступа к файлам cookies на своем браузере. Продолжение пользования данным веб-сайтом без внесения изменений будет означать согласие с используемыми на нем инструментами.